Just so folk know, the Armatron seen just a few days ago is currently on ebay. I said it would be going up, and it has. 4 days to go! I’ve not been very well these past few weeks, but things are brightening up. 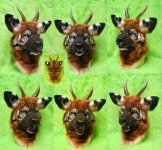 To get myself back in the saddle, I decided to do some tinkering and sate a long-standing curiosity. 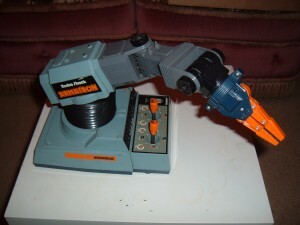 In the late 70s to mid 80s, Tandy/Tomy made the Armatron. A robotic arm with six degrees of freedom. I never got to own one as a child, as they were off the market by then. But earlier this year I found one going cheaply on ebay, and pounced. While the magic of a robot arm has perhaps faded a little, it was the conversion of one to steam by CrabFu Steamworks that pointed out the unique property of this toy. The whole thing is driven from one electric motor. The full 6 degrees of motion are driven entirely mechanicly, via two joysticks. The CrabFu article had one tantalising view of the mechanism within, but no details on how it actually managed to channel the power via joysticks. I had to know how this gearbox worked!